The role of the local Additional Deputy Commissioner (ADC) in disbursement of funds allocated under the National Rural Employment Guarantee Act (NREGA) has come under a cloud, as per recent developments. With the Punjab and Haryana High Court today issuing notice of motion to Haryana, land allotment to the Rajiv Gandhi Charitable Trust (RGCT), run by UPA chairman Sonia Gandhi, her son Rahul and daughter Priyanka Gandhi, has come under the judicial scanner. With hundreds of SUVs and other vehicles hitting dusty village roads, the INLD and the Congress have intensified their poll campaigns for the Ratia Assembly byelection. The INLD today lodged a complaint with the Election Commission seeking stern action against the District Social Welfare Officer (DSWO), Fatehabad, for amending lists of old-age pensioners in violation of the model code of conduct. Taking strong exception to the Kurukshetra University claim that an agreement has been reached with the Kurukshetra University Teachers’ Association (KUTA), KUTA president Pradeep Chauhan said today if the agreement was reached on November 11, why teachers started an indefinite dharna yesterday. The Congress campaign in Ratia Assembly byelection will get a boost with Chief Minister Bhupinder Singh Hooda addressing a series of public meetings in the reserved constituency tomorrow. The Congress has suffered a setback with Jagdish Mistri, who had contested the Ratia seat on the in 2000, quitting the party.He joined the INLD in Chautala’s presence today. The Province of British Columbia in Canada and Haryana have agreed to form a working group for mutual cooperation and assistance. They have also agreed for mutual cooperation in the field of food processing and mining. Haryana Chief Secretary Urvashi Gulati has directed all Deputy Commissioners to prepare off-site emergency plans of their district within two months to ensure minimal impact on life and property due to chemical accidents at the major accident hazard (MAH) units or during transportation of hazardous chemicals. The National Forum of Artists and Activists (NIFAA) will collaborate with Mauritius-based NGO Pour L Education ET La Rehabilitation Des Personnes Avec Deficiences Intelectuelle (Association for Education and Rehabilitation of Persons with Intellectual Disability) APERPDI on short-term training programmes for special children. The police has booked 10 persons of Chhainsa village, including parents of a girl, on her complaint of being forcibly married to another person, even though she had tied the nuptial knot with Narender from the same village, but a different caste. The licences of 14 depot holders were cancelled and security amounting to Rs 66,500 of 23 dealers was forfeited by the Food and Supplies Department during September for committing various irregularities in the distribution of essential commodities. 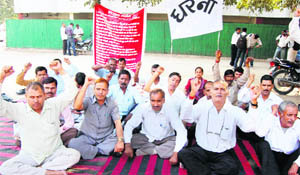 The Haryana government has decided to regularise the strike period of September 7, 2010 of the employees of all the Haryana Power Utilities as a part of nationwide strike call given by National Trade Unions, including Haryana Bijli Karamchari Joint Action Committee. The Additional District and Sessions Judge, Dr Neelima Shangla, today dismissed the bail plea of three persons who attempted to murder Jagga Singh Brar, a key witness in Congress leader Chander Singh Brar’s murder case. He is also the brother of the late leader. A woman was killed whereas nine other were injured in a bloody clash in Dharampur village, Gharaunda, near here last night. The family members of Amarjit were busy with a marriage ceremony when a group of people from Barsat village suddenly attacked them with swords and also pelted stones injuring nine persons and killing one. An attempt by an undertrial prisoner to escape while being taken to a court was thwarted by the cops escorting him here yesterday. The official, who had earlier employed his son under the employment guarantee scheme, has now been accused of releasing funds and issuing cheques under the scheme without verifying the works for which the payments were being made. After receiving reports of alleged irregularities in this regard, Balraj Singh Mor, Nuh Deputy Commissioner, on Tuesday raided the ADC’s office and found that cheques for making payments under the NREGA were being issued in haste. Mor got the payments stopped, confiscated cheque books and ordered that no payments be made henceforth without his prior approval. The ADC was not present in the office at the time of the raid. On being contacted for his comments, the DC said he had received reports about payments being made under the NREGA without carrying out the requisite verification of the works done. “I have asked the ADC and his office staff not to sign any cheque or make any payment without my prior approval. The payments made before I passed the said order will also be examined to rule out the possibility of any irregularity have been committed in this regard,” he said. Meanwhile, the local ADC, who was already under transfer, today got relieved. He is supposed to join as the ADC, Rewari. In their petition, Dharamvir and five other villagers have challenged the government’s decision to allot around five acres to the RGCT run by the Gandhi family. A challenge has also been thrown on the allotment of nine kanals to another trust-Church Gate Medical Society. The petitioners have contended the government has allotted land to the RGCT with the sole purpose of pleasing the trust. Seeking directions to quash the December 6, 2010, orders vide which the land was directed to be released from acquisition despite issuance of notifications under Section 4 & 6 of the Land Acquisition Act in order to facilitate the RGCT to set up an eye hospital and a research centre. For the INLD, former Chief Minister Om Prakash Chautala resumed his village tour after a seven days today while his two sons, Abhey Singh and Ajay Singh, will start campaigning here from Friday and Saturday, respectively. Chief Minister Bhupinder Singh Hooda reached here this evening for his village tours tomorrow while Anita Verma, president of the All-India Mahila Congress, addressed a convention to mobilise women today. “You have an elected government in Haryana for another three years. Votes for Jarnail Singh and become a part of the government,” Anita Verma exhorted women. Addressing a series of village meetings, Chautala alleged that basmati paddy that earlier sold for Rs 2100 per quintal, was selling for Rs 1200 while cotton prices had plummeted to Rs 3500 per quintal due to “anti-farmer” policies of the Congress government. 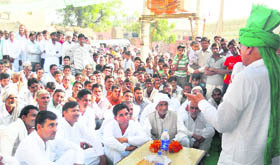 state INLD president Ashok Arora campaigned in Punjabis-dominated villages of Ratia to seek votes of members of communities, who had migrated from Pakistan after Partition. A number of ministers and other party leaders have joined the campaign for Congress nominee Jarnail Singh. Ministers HS Chatha and Paramvir Singh, Chief Parliamentary Secretaries Prahlad Singh Gillankhera and Vinod Bhayana, HPCC president Phool Chand Mullana, Sirsa MP Ashok Tanwar, Rajya Sabha member Shadi Lal Batra, among others, campaigned for the Congress nominee today. BJP president Krishan Pal Gurjar campaigned for BJP nominee Mahavir Parshad today. The INLD said DSWO Jitender Singh Dhillon had been trying influence voters by including new beneficiaries in the lists at Ratia, where a byelection is scheduled on November 30. The INLD has sought a thorough inquiry into the matter and stern action against the officer. Meanwhile, ML Kaushik, Deputy Commissioner, today directed the Social Welfare Department to stop receiving applications for the inclusion of new beneficiaries for various social security pensions. Kaushik maintained that not a single new name had been included in the existing lists, and the department was merely receiving applications as part of an ongoing exercise. The exercise has since been suspended in Ratia till the model code of conduct is in force, Kaushik added. “The authorities are not bothered about the violation of the University Act, ordinances and EC resolutions in a number of cases and nothing has been rectified even after several requests. Moreover, misbehaviour with teachers by lower-level officials has become the order of the day. Such incidents were reported to the Vice-Chancellor but nothing followed” he added. The KUTA general body meeting today decided not to hold further talks till the VC removed the OSD. “We have been trying to avoid a confrontation for the past six months but unfortunately the top varsity authorities are not serious about our demands in spite of several rounds of discussion. We had served notice in August to start an agitation on September 1 but postponed it many a time on VC’s assurances. The authorities have not kept their promises and started distorting facts. The teachers raised slogans against the VC and started an indefinite dharna yesterday. KUTA President made it clear to the authorities that the stir would continue till all demands were implemented. He said the stalemate is regarding proper implementation of the Haryana Government notification, Ph.D/M.Phil/ M.Tech/LLM increments, EC membership to all deprived university teachers, removal of anti-teacher officials , adherence of the University Act and ordinances, besides all service benefits to self-finance scheme (SFS) teachers. Dr Chauhan urged the Chief Minister to intervene and demanded an emergency KU executive meeting on these issues. He cautioned the VC that the stir would become statewide as teachers of over 200 colleges had extended support to KUTA. This will be the first visit of Hooda to the constituency after he addressed a meeting when party nominee Jarnail Singh filed his nomination papers. He plans to visit the Adampur Assembly constituency on November 25. In between, he would remain busy with certain marriage functions, including that of the daughter of his Principal Secretary Chhatar Singh. He has also to participate in what is being termed as the matrimonial union between two political families of the state. Incidentally, both families are close to him. A son of former minister and MLA from Ambala Venod Sharma will get married to a daughter of Haryana Speaker Kuldeep Sharma at Karnal on November 22. However, the ceremonies would start on November 21. Meanwhile, the battle at Adampur has taken an interesting turn for the Congress and the INLD. It is no longer a tussle between the party candidates, Kulbir Beniwal and RS Basvana, with former Finance Minister Sampat Singh and INLD Secretary-General Ajay Singh Chautala having taken up cudgels for their respectively party nominees. Sampat Singh is campaigning for the Congress in Adampur. After delimitation, several villages of his erstwhile constituency of Bhatu have been attached with Adampur. Sampat, who had quit the INLD to join the Congress before 2009, is going all out to woo the voters in these villages for the Congress. Since these villages have come to Adampur only recently, they are said to be free from the influence of the Bhajan Lal family, which otherwise dominates Adampur. Ajay Singh, who lost the recent Hisar Lok Sabha byelection to Kuldeep Bishnoi of the HJC by a narrow margin, is also concentrating on these villages, from where Sampat had been winning on the INLD ticket. The INLD considers these villages as its strongholds and, therefore, is depending upon these to give a respectable tally to Basvana. Mistri said he was quitting due to the party’s discriminatory attitude. This decision was taken at a meeting of Haryana Chief Minister Bhupinder Singh Hooda with the Premier of British Columbia, Christy Clark, in Chandigarh. Hooda offered to form a working group, which was later accepted by her. Clark also invited the Haryana Chief Minister and Agro industry leaders to Vancouver for the proposed Agriculture forum’s meeting, which is likely to be organised in 2011. She said Haryana and British Columbia could share technical expertise in the field of IT, food processing and mining. India and Canada complement each other and therefore it was of mutual interest, she added. Clark sought to know what attracted the auto and other industry to the state, which is considered an auto hub. The state contributes 50 per cent cars and motorcycles, 30 percent refrigerators, 25 per cent tractors of the total production of India. The Chief Minister said per capita investment of the state is highest in India. Hooda invited the International Firms from British Columbian to invest in the International Horticulture Market at Ganaur. He said the proposed market would have excellent logistics. He also invited the delegates of business people from British Columbia to visit Haryana as it has enormous opportunities. Clark accepted the offer and said that British Columbia has expertise in the field of preservation and Canadians would be proud to be part of it as this region was considered the breadbasket of India. Haryana Chief Minister also sought the Canadian expertise in mining. Gulati was presiding over the first meeting of the State Crisis Group, which has been constituted for the management of chemical accidents and to provide expert guidance for handling major chemical accidents and preparedness of off-site emergency plans. She said the off-site emergency plans should incorporate the preparedness and response to an emergency arising out of occurrence of major chemical accidents in industrial units. The plan should also provide for the rescue and relief of the affected people and protection of property and environment. The districts should also share the recommendations of the enquiries into such mishaps earlier for providing an insight into the causes, consequences and to learn the lessons so that such incidents were prevented in future. She also directed the DCs to constitute local-level crisis groups where there was a cluster of maximum accident hazard industrial units. Gulati said emergency services such as the police, fire, medical and transport need to be prepared in advance to handle such situations effectively. She said the Bhopal gas tragedy of 1984 had made people all over the world aware about the seriousness of chemical accidents. The plan should be regularly updated when there were changes in the industrial set-up and transportation aspects. The members of the State Crisis Group included Secretaries of the Departments of Labour, Environment, Health, Industries, Transport, Public Health Engineering, Chairman, Pollution Control Board, and experts of Industrial Safety and Health. As per an MoU signed between Balraj Boodooa, chairman of APERPDI, and Pritpal Singh Pannu, chairman of NIFAA, NIFAA would provide doctors, trainers, and dance teachers dealing with special children for short-term training programmes at Mauritius and also arrange pannel theatre (a Japanese education technique for junior class children and special children) teachers from Japan to conduct workshop at Mauritius to train teachers of Mauritius. NIFAA would also organize a cultural programme at Mauritius where some budding and renowned artists of India would be invited to present a cultural show. Balraj Boodooa, who was here to seek support for welfare and rehabilitation of special children, also visited the Viklang Shishu Parshikshan Kendra at Sant Nagar here and interacted with special children and their teachers. Pooja (name changed), the victim, further alleged that the accused indulged in aborting her pregnancy. She had conceived on account of wedlock with Narender. The FIR was registered in the wake of the directions of the Punjab and Haryana High Court to the authorities for a suitable action in the case. The victim and her husband had approached the court seeking justice. Preetpal, area SHO, said the girl’s parents, brother and some other residents of Chhainsa had been booked under Sections 170, 313, 325 and 506 of the IPC. “No arrest has been made as investigation is yet not completed,” he said. According to the police, the girl eloped with Narender, the next-door-boy in Chhainsa, from Bhupani village where she had gone to attend a wedding party. 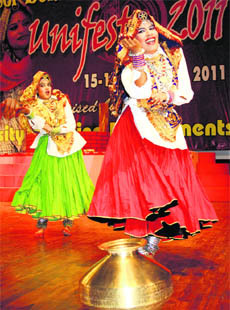 They are adults and they married in Rajasthan. Pooja in her complaint alleged that her parents sent Bishan to her at Ajmer (Rajasthan) where she was staying with Narender after she married him in February. He introduced himself as a police personnel from Faridabad and said that the SP had called for them. When the couple came to Faridabad, the girl’s parents met her and Narender. They allegedly threatened her husband of dire consequences and forced him to go without her. The parents married her to Lokesh of Bulandshehar (UP), on March 10. According to Pooja, her parents procured a medicine from a ‘tantrik’ through Om Pal of the village to terminate her pregnancy prematurely. She further alleged that her parents and their accomplices had threatened to liquidate her and her husband along with the in-laws. Mahender Partap Singh, Food and Supplies Minister, said essential commodities were being supplied through 9,370 fair price shops, including 6679 in rural areas and 2,691 in urban ones. As much as 44,005.3 metric tonnes of wheat was distributed through fair price shops among BPL families and Antyodaya Anna Yojana (AAY) beneficiaries during September, the minister said. While stating this here today, the Power Minister, Capt Ajay Singh Yadav, said the HSEB Workers Union (HO), Bhiwani, and the All-Haryana Power Corporation Workers Union (HO), Hisar, under the banner of Haryana Bijli Karamchari Joint Action Committee had served a notice on August 24, 2010 for its participation in the proposed strike on September 7, 2010. Instructions were issued by all the Haryana Power Utilities that no leave of any kind, including casual leave, be allowed to any official except for in very exceptional circumstances on September 7, 2010 in order to maintain continuity of power supply in the state. However, 19,357 employees out of the total 29,149 employees participated in the strike. He said now the strike period of the employees has been regularised. The accused Chhotu Ram alias Chhotu Bhaat and Malkhan, both residents of Chautala village, and Harpal Singh, a resident of Matdadu village, had allegedly attempted to murder Jagga Singh on March 17. Chhotu Bhaat and others allegedly stopped vehicles of Jagga Singh Brar and others near Odhan and fired at them. A case under Sections 307, 148 and 149 of the IPC and Sections 25 and 27 of the Arms Act was registered against them. Chander Singh Brar, a prominent Congress leader of Dabwali, was murdered on April 29, 2006 during the INLD regime. The INLD leaders Pardeep Godara, Vinod Arora and some others were arrested in this connection. While denying bail to the accused, the judge observed that Chhotu Bhaat was a habitual offender, who was involved in eight cases. The victims have to appear for their testimony against the accused on December 2, 2011. The attack was unprovoked said the family members of Amarjit. The villagers of Barsat came to Dharampur to resolve a quarrel that took place between children of the two villages yesterday. Amarjit’s wife, who was critically injured, was taken to trauma centre at Karnal where she was declared dead. Sher Singh, alias Sheru, lodged in a Kurukshetra jail tried to escape from a bus near Nirmal Kutiya while he was being taken to the Karnal court under police cover. Sher Singh who was accompanied by EASI Gurcharan Singh and Head Constable Nirmal Singh ran away when the bus stopped at Nirmal Kutiya. Gurcharan Singh fired a shot in the air and warned the prisoner who finally surrendered. Sher Singh was booked by the Karnal and Kurukshetra police under numerous cases of dacoity and the Arms Act. A case under Sections 224 and 225 of the IPC was registerd against the undertrial.